Army veteran Jesse Horl says the Veterans Inc. facility has provided him with his own space, for the first time in seven years. Tom Porter reports on the opening of a Veterans Inc. facility in Lewiston. LEWISTON, Maine - On any given night, there are nearly 50,000 veterans nationwide who don't have a place to live, according to ta federal survey last year. A Massachusetts-based non-profit, Veterans Inc., is dedicated to lowering that number. It's opened a new residential facility in central Maine, a converted elementary school in downtown Lewiston. Veterans Inc, explains Ray Michaud, purchased the building about four years ago, and with the help of some local businesses created a 20-room transitional residence for male beterans who have nowhere else to go. Michaud, who served 20 years in the Air Force, describes himself as the site manager. But he has another, more pastoral, role. "I'm the 'Big Daddy' of the facility." If any of the residents need some paternal advice, he's there for them. "You know, when these guys come home from school, from work, they want to talk to Big Daddy. I'm Big Daddy." Residents can live here for up to two years, says Michaud, but they have to follow fairly tight rules. Because many of them have had problems with substance abuse, alcohol and illegal drugs are not tolerated. Also, guests are not permitted in residents' rooms. "You know, that's part of what they need - they need structure," Michaud says. "Some of the vets that are out there coming from a homeless situation, that's what their issue is, is there's no structure for them." The corridors are lined with various flags, some representing different branches of the service, some commemorating military campaigns. Each room has its own bathroom and kitchen area. As well as providing a roof over their heads, Veterans Inc. also puts vets - like 39-year-old Jesse Horl from Orlando, Florida - in touch with employment and training opportunities. "I joined the Army when I was 17," Horl says. "I went to basic training at Fort Benning, and airborne school. I turned 18 during the jump school." Horl's three-year stint in the Army saw him deployed to Haiti twice in the 90's as part of a U.N. peacekeeping force. Since leaving the military, Horl says his life has, at times, been unstable, and he's ended up on the streets or in a shelter. Most recently, he says, he was hospitalized at a substance abuse treatment center for homeless vets in Orlando. Horl relocated to Maine after his social worker put him in touch with the new Veterans, Inc. residence in Lewiston, and now, for the first time in nearly seven years, he has his own living space. "It's a nice facility," Horl says. "It's good I don't have people right next to me sleeping. I have my own room, my own kitchen I can cook in, got my own bathroom I don't have to share with anybody. It's a right place for me to be right now." Horl is enrolled at culinary school and has clear ideas about where he'd like to be in two years time: "Hopefully having my own place, and having a significant other, maybe, and just being able to live like a normal person." Navy veteran Rich O'Neil, a self-described I-T "nerd," says he's grateful for the opportunity provided by Veterans Inc.
Rich O'Neil, a native of York County, sits in his room surrounded by computer screens. He's a self-described I-T nerd and former radar tech with the U.S. Navy. After his six years in the service, O'Neil, who's 58, says he never really settled. "When I came out of the Navy what I really should have done was go and work for Raytheon or somebody like that," O'Neil says. "But at the time I was young. All I wanted to do was play music." O'Neil says he played in a band, worked a number of low-paid jobs, and moved closer to homelessness. "I found myself out of a job, found myself not living with girlfriend shortly thereafter." 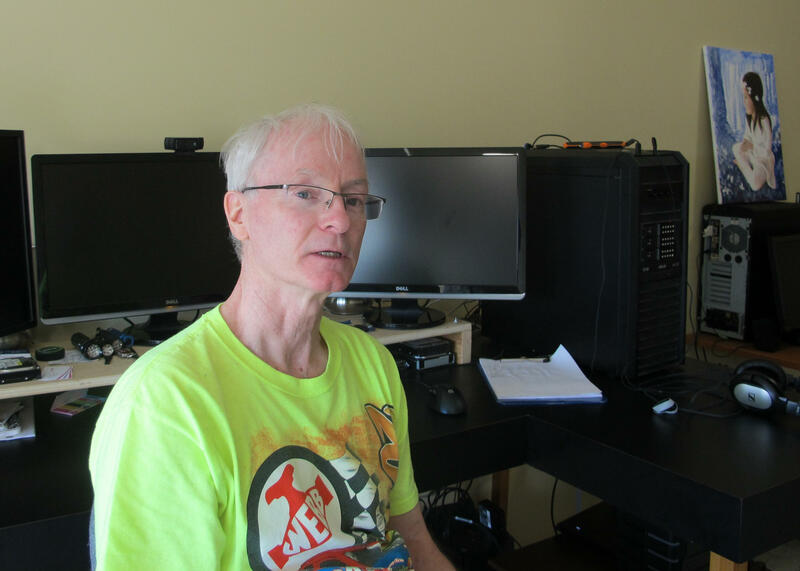 He was able to live with his sister for a while, but O'Neil's options were running low when he came across the new Veterans Inc. facility, where he's pursuing his I-T certificate and planning for independence. "Take advantage of this opportunity," he says, "learn as much as I can, hopefully become employed, maybe save a few bucks and then get out there on my own and kind of start living the workforce life that I should have gotten into right out of the service, you know." "There are probably more homeless veterans in Lewiston-Auburn than probably we even know," says Carolyn Cutting. "Oftentimes they're not right in front of us." Cutting is the Maine state manager for Veterans Inc., which is funded in part by federal grant money. There are just two other residential facilities solely for veterans that she knows of in the state, she says, and they're both in southern Maine. Cutting says this site was chosen because of its public transportation links and its proximity to community outreach clinics. "And it's been wonderful to see the gentlemen come in, start new lives, start training, think about the future, have hope," she says, "not have to worry about what they're going to eat tomorrow or where they're going to sleep, but really start to think about long-term plans." And for residents like Jesse Horl, to spend more time with other vets. "So we already know how some of us are going to react to certain things, and we have our own language that we speak, compared to other people that you just meet on the street," Horl says. "So it's kind of like coming home." AUGUSTA, Maine - A measure to build cabins for homeless veterans with $1 million in state funding has overcome its first hurdle. The Kennebec Journal reports that the Labor, Commerce, Research and Economic Development Committee unanimously supported Rep. Jared Golden's proposal on Thursday. It heads to the full Legislature.